After a long summer of rest and rejuvenation, I’ve been so busy being back in the classroom that I haven’t been able to blog. 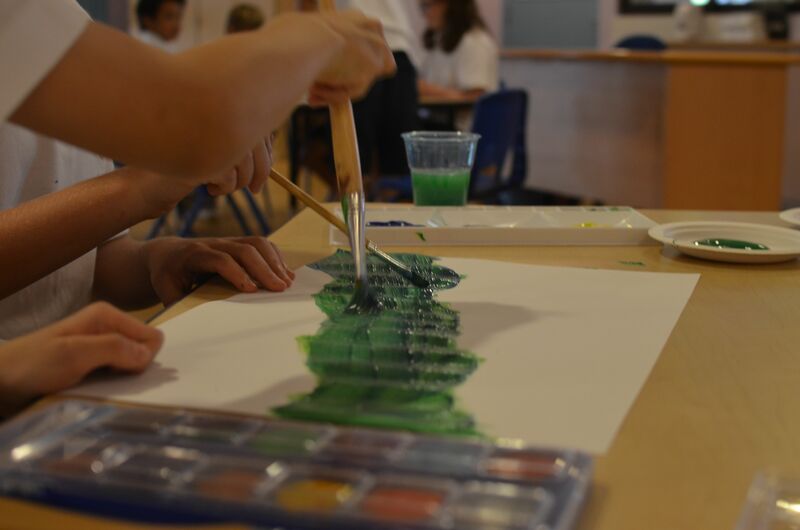 There has been so much going on already in year 2 in Singapore that I want to share with you! 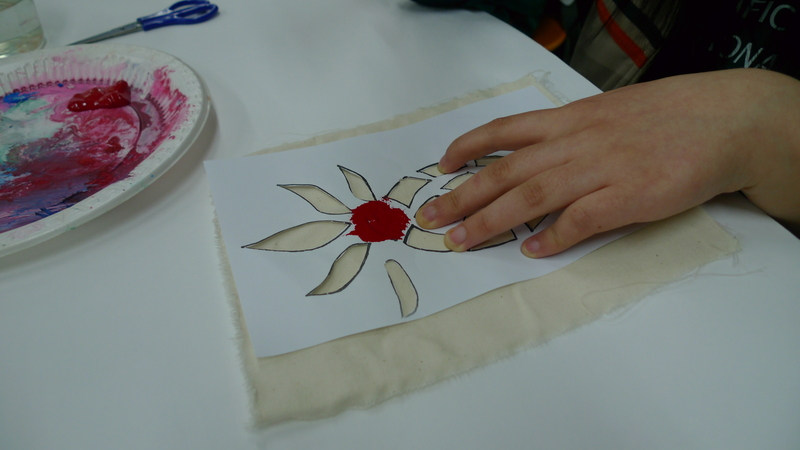 This year, I tried a new beginning of the school year project. 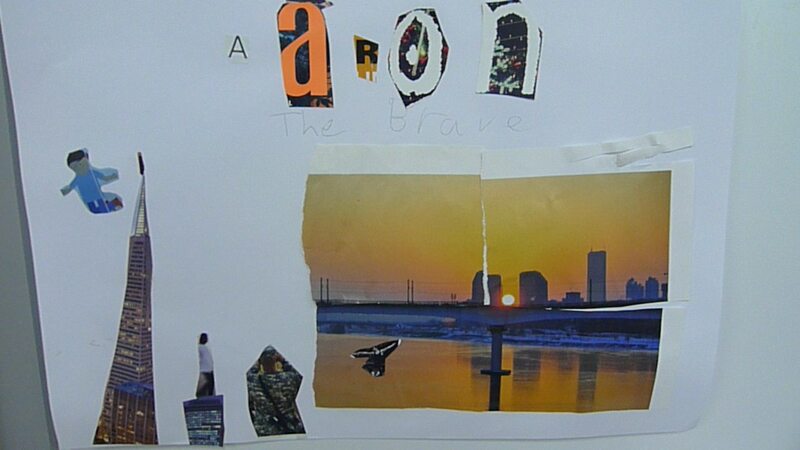 My mentor teacher from last year, Linda, does this great silhouette activity with her students. I knew that this year, I wanted to try it with my kids! 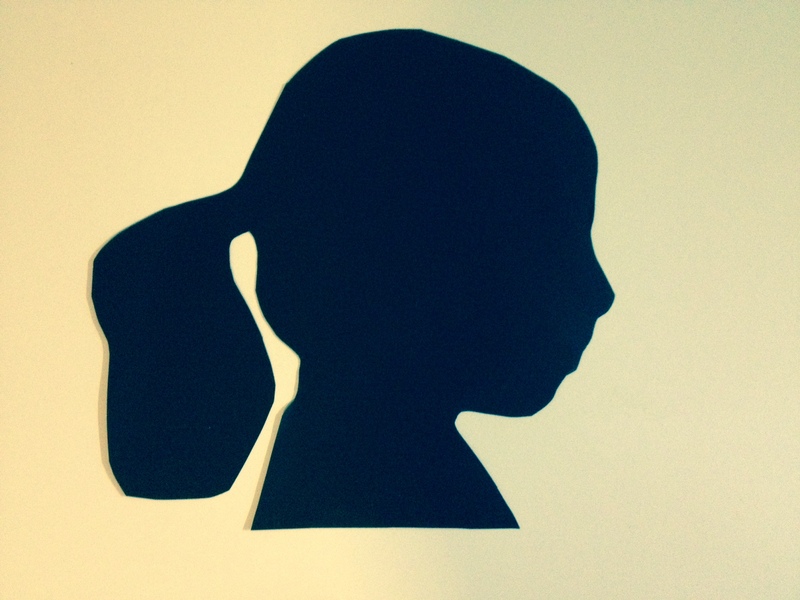 In order to have the students create their silhouettes, I used the steps I found on this blog post: how to make silhouettes of your kids . I took a photo of their side profile against a solid background. Then, I printed out their photo in black and white. I took their photo and enlarged it on the copy machine to a bigger sheet of white paper. Once I got the settings on the copy machine right, I copied all the printed out silhouettes with the same settings. Then, I had the students cut out their profiles and glue it onto thicker black construction paper. They cut out their profiles again. 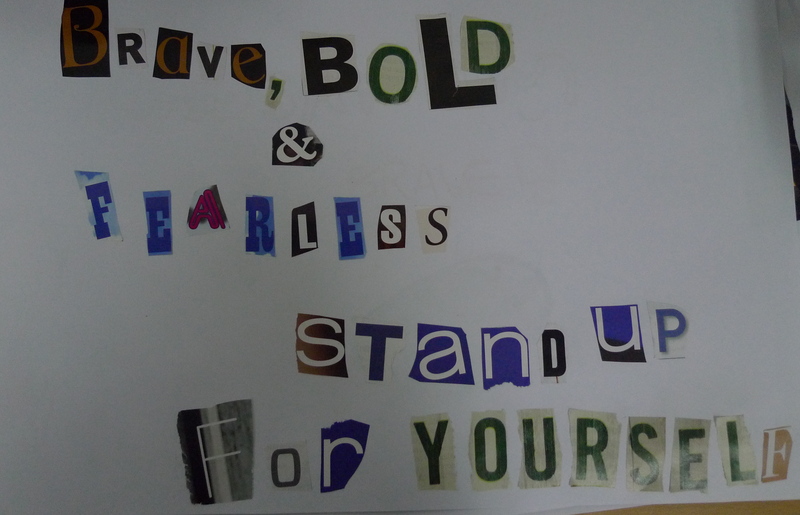 Now on the black side of the paper, I had them glue on photos and words from magazines that described them. I also had some print outs of photos I took of them and their families from our open house. I had them put those photos on. 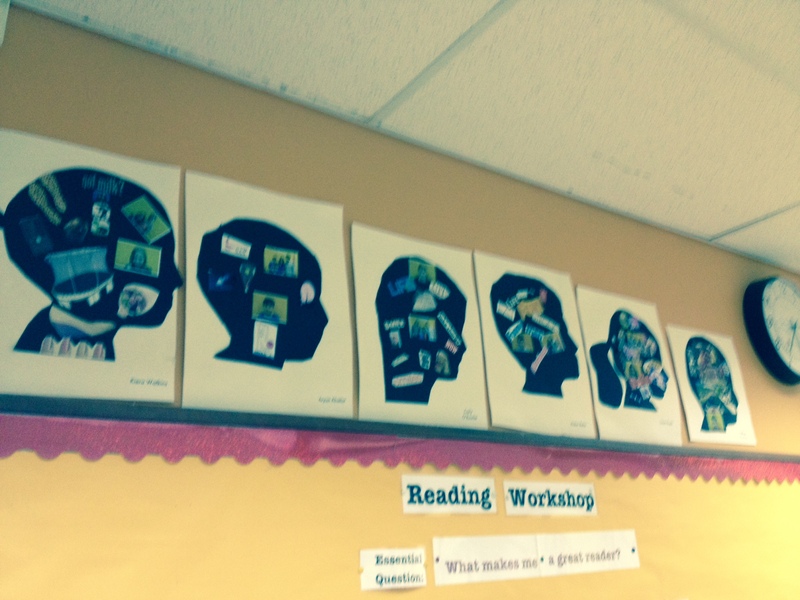 After their silhouette collage was done, I hung them up in the back of my classroom! What are some of your favorite back to school activities? 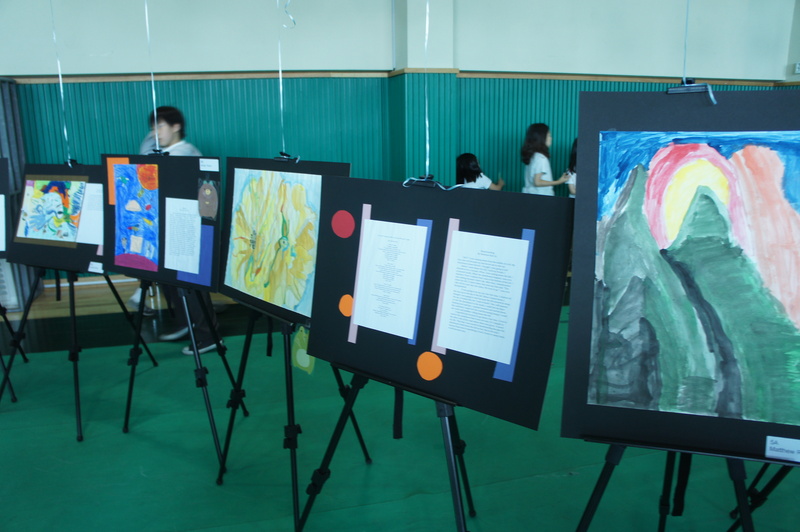 A few weekends ago, my school hosted a Children’s Literature Conference. 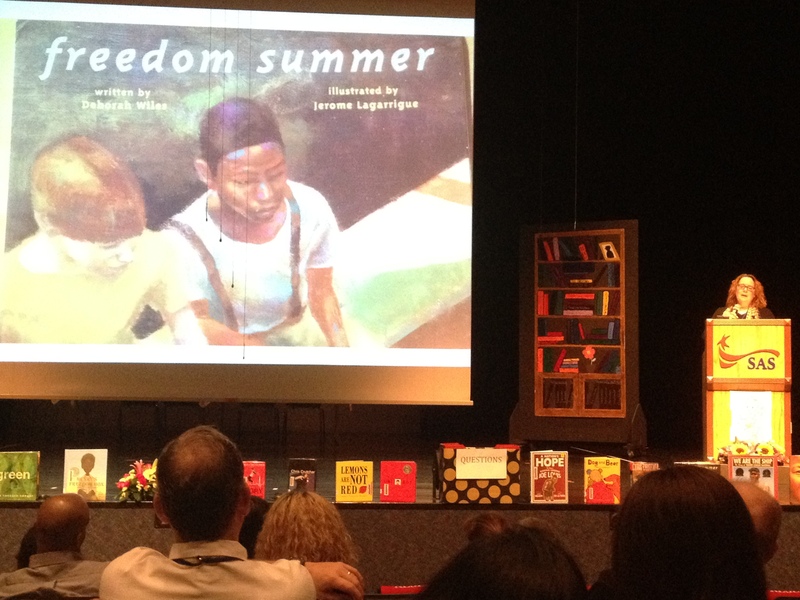 We had amazing authors and illustrators give keynotes and lead workshops. 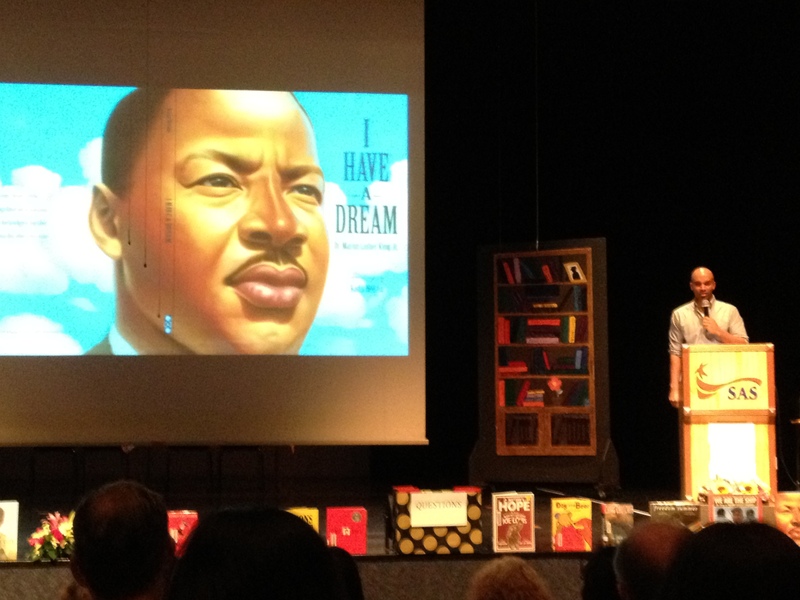 The authors and illustrators that attended were Deborah Wiles, Kadir Nelson, Laura Vacarro Seeger and Chris Crutcher. I’m a huge fan of Kadir Nelson’s artwork, especially in the book, A Nation’s Hope! They shared their stories while challenging us to tell our own stories. Not only did I want to buy all these amazing books that these authors wrote and illustrated afterwards, but I was inspired to start writing my story. One of the author/illustrators that came was Laura Vacarro Seeger. 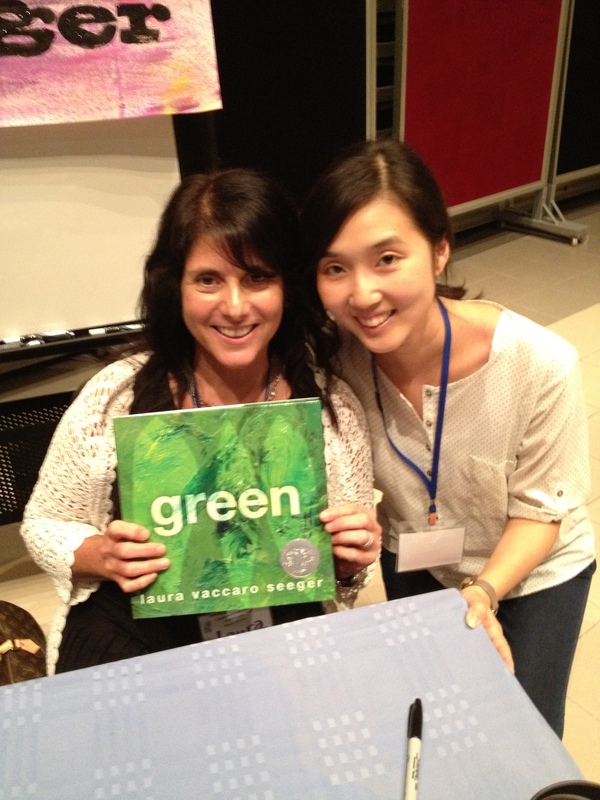 Her most recent picture book, Green was a Caldecott Honor book this year! 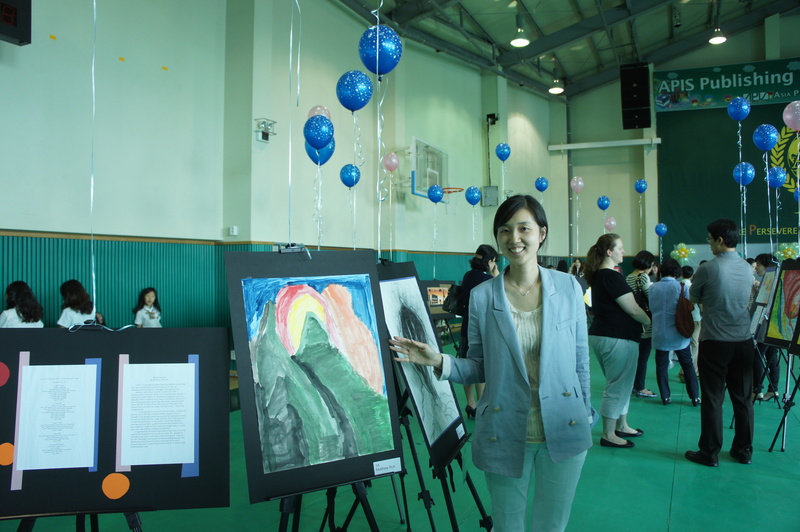 She presented her inspiration for her various picture books by sharing her sketches and writer’s notebook. I was amazed at how she took pictures books to a whole new level through her creativity. 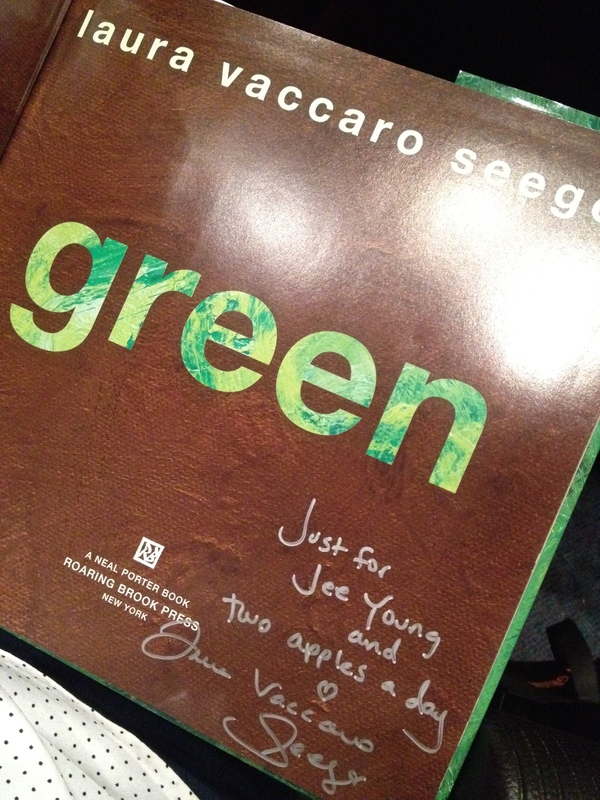 I especially loved her book Green. Here is an amazing video of her book. 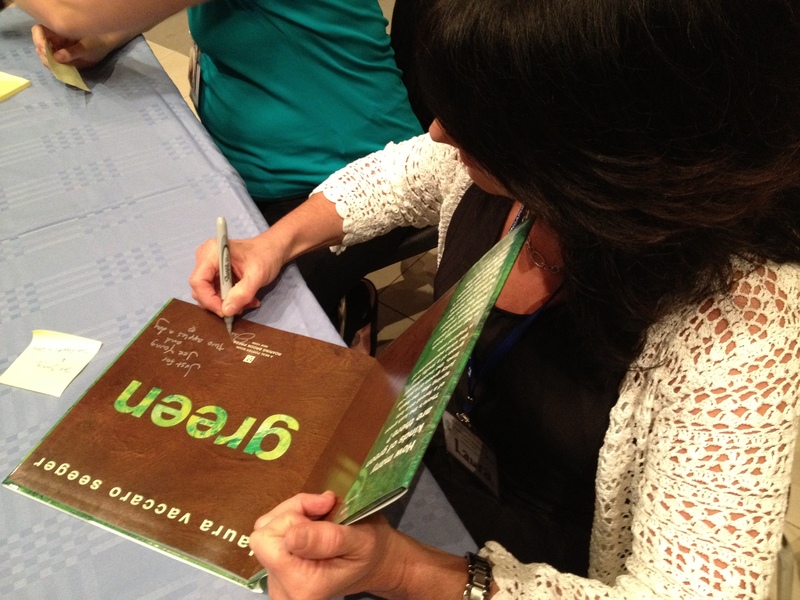 Laura even signed my book and took a photo! 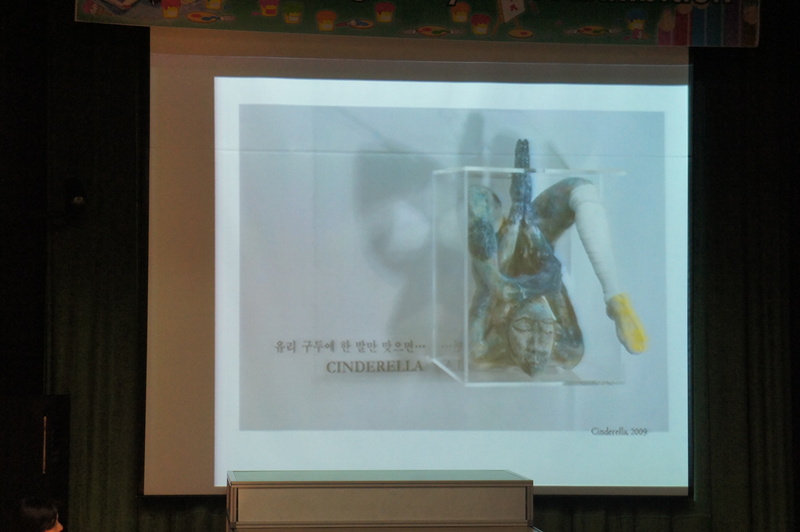 I found out later that she actually worked with my students in their art class. In addition to that, I had my students and their book buddies (2nd grade class) do an art activity together based on the book. 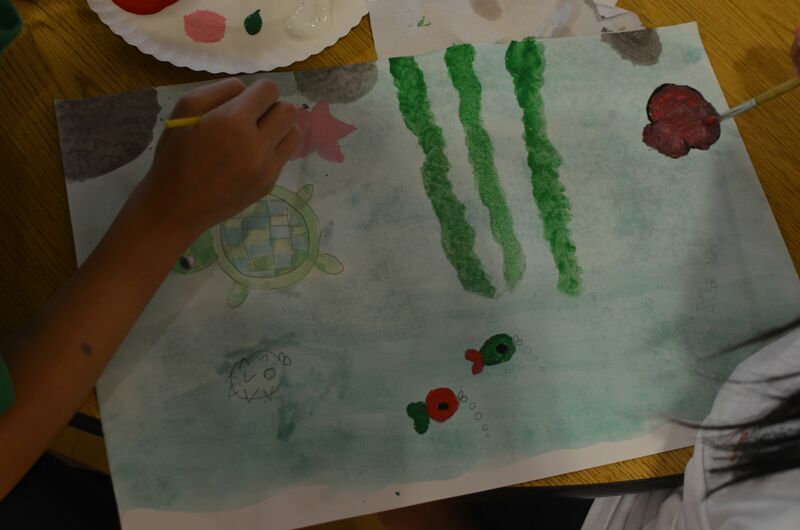 After reading the book to them, we had the kids come up with their own “green” page in order to create a class book. They thought of a phrase and then drew the artwork to go with it. There were some very creative drawings and phrases from exit green, fast green, grass green, ocean green, funky green, alien green, jewel green and more! Thank you Laura for your inspiration! Everywhere I went in Paris, I saw students! I saw students on field trips in the Louvre, on our night river cruise, Versailles, on the streets of Champs Elysees, and even on our airplane. At times, I was glad that I was on break and didn’t have to travel to other countries with my students. It was pretty cool to think that the students in France could easily go to see the Mona Lisa on a field trip. I wonder if they even know how lucky they truly are to be living in a city with such amazing and significant pieces of art all around. 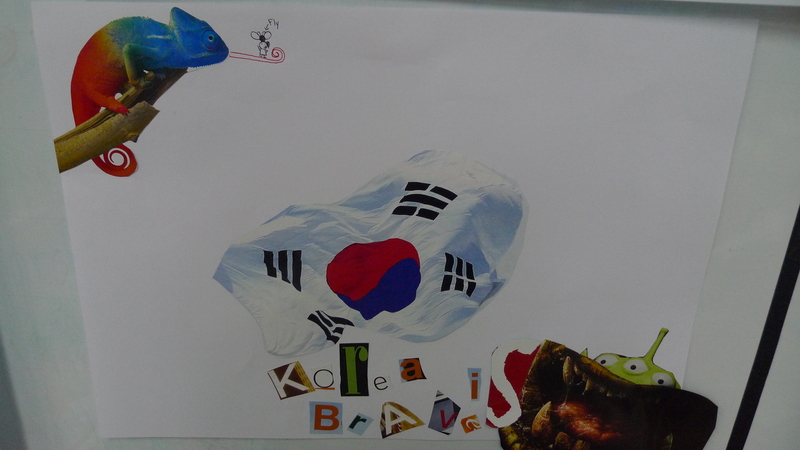 This reminded me of my students and the fun we have going on field trips here in Korea. Here are some of the fun places I’ve been to with my students within these past 4 years. Gyeong Bok Palace- Folk Museum?? What is your favorite field trip? Are there any other good places you recommend for field trips in Korea? 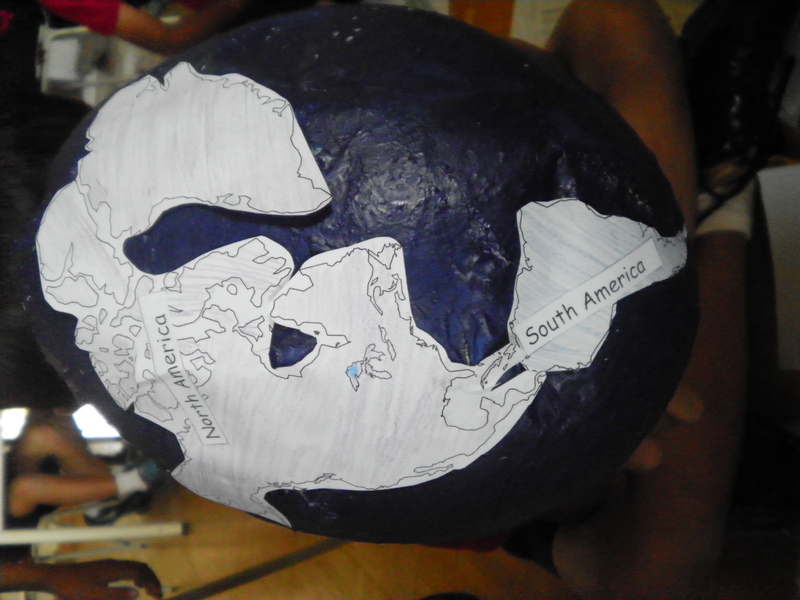 Guest Blog Post: Paper Mache Globes! 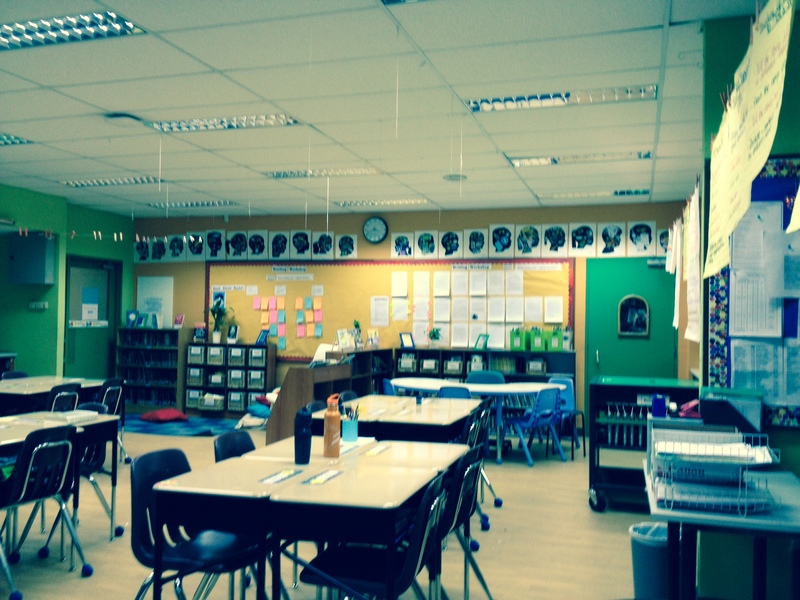 Deirdre and I started our international school careers at the same time four years ago here in Seoul. After two years in Seoul, she moved on to India! She is truly living the life of an international school teacher. I currently teach some of her 2nd grade students from her first year at my school, and they always tell me about the fun times they remember from her class! 1. Cover all desks with newspaper. 2. 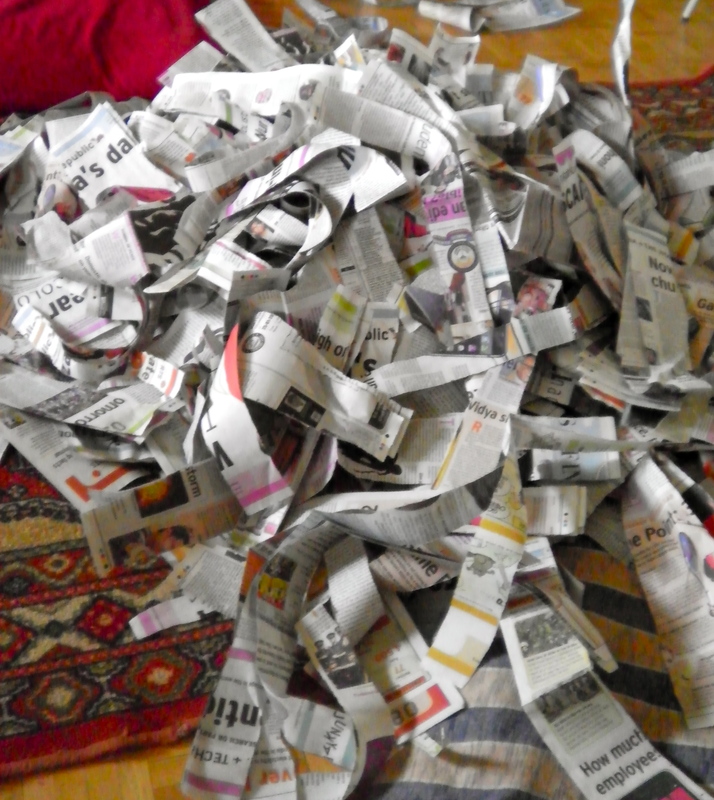 Collect old newspapers and have the students tear into long pieces, about one inch thick. Have one student from each group place shredded newspaper on the groups’ desks. 3. Blow up balloons and leave balloons on the student’s desks. You may want to blow up the balloons prior to the activity for younger students. 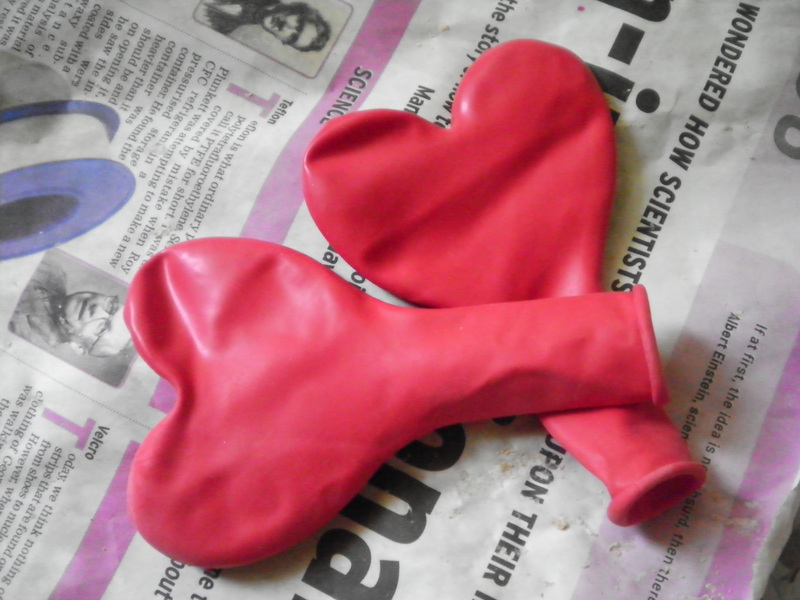 We used heart balloons because it was Valentine’s Day! The measurements may need to be adjusted … you will know when you have it when the mixture is slightly thick. 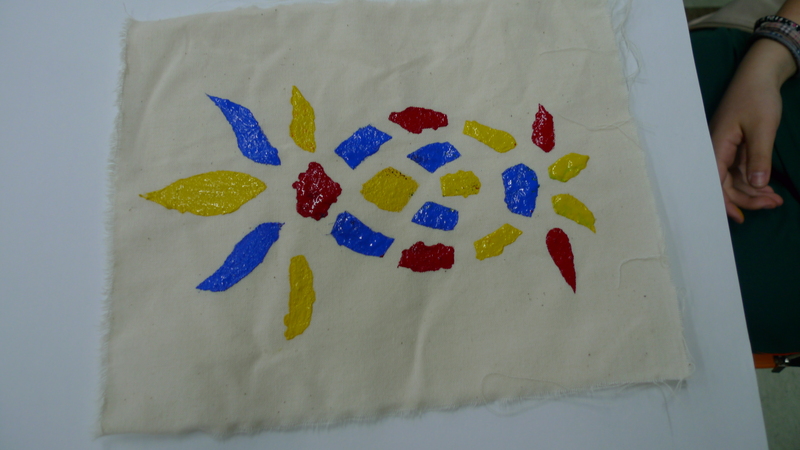 I did this with my students and had a few measure out and add the flour, water and glue. I mixed it until it became thick enough, first with a spoon and then with my hands. 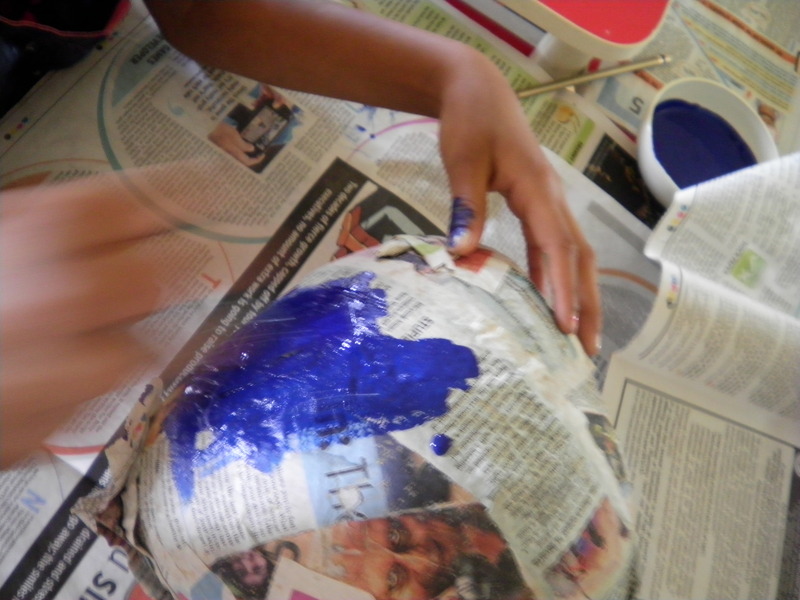 Then I modeled exactly how to take the paper mache goop, cover a strip of newspaper and place it onto the balloon. 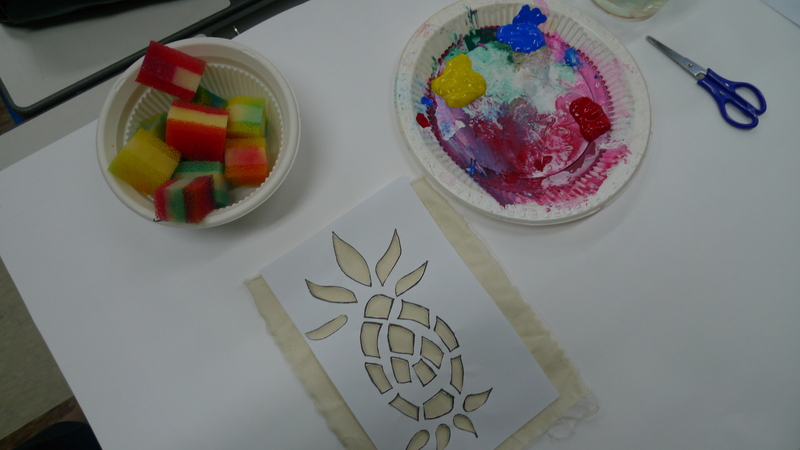 We talked about what the students noticed: that I was calm, that I only placed the goop onto the strip of newspaper and balloon etc. Then I poured the mixture into four bowls (we have four groups) and asked who was ready!? 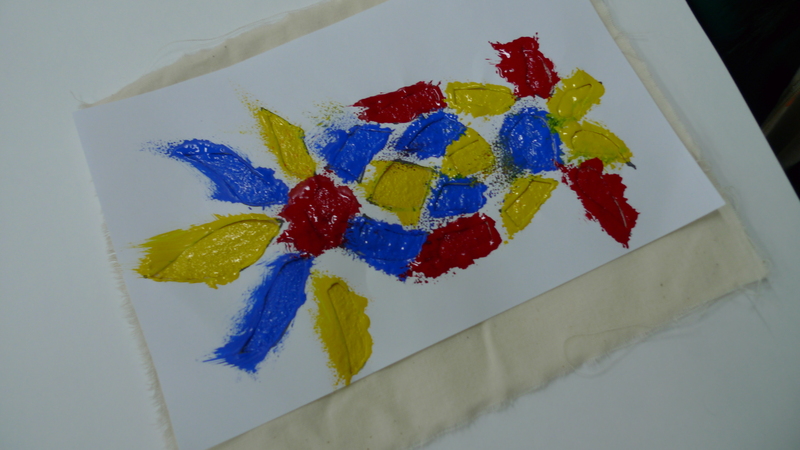 This activity is best to do on a Friday because it allows the paper mache to dry over the weekend. 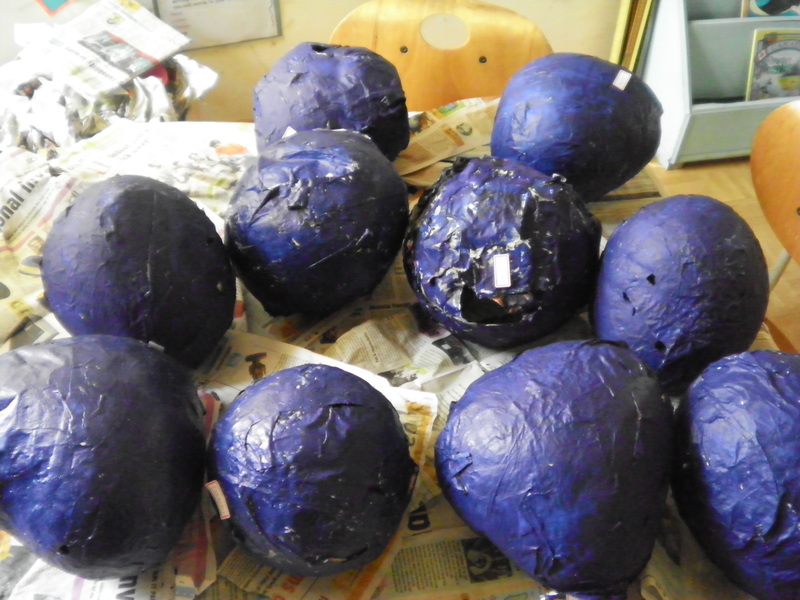 Then on Monday the students can paint the balloons and let dry for a day or two. Finally, we hung them up in our room! For our elementary school’s Read Across America day, we always choose our own theme. We also have a chance to teach other classes from different grades as they rotate classrooms. The theme this year was author Kevin Henkes. 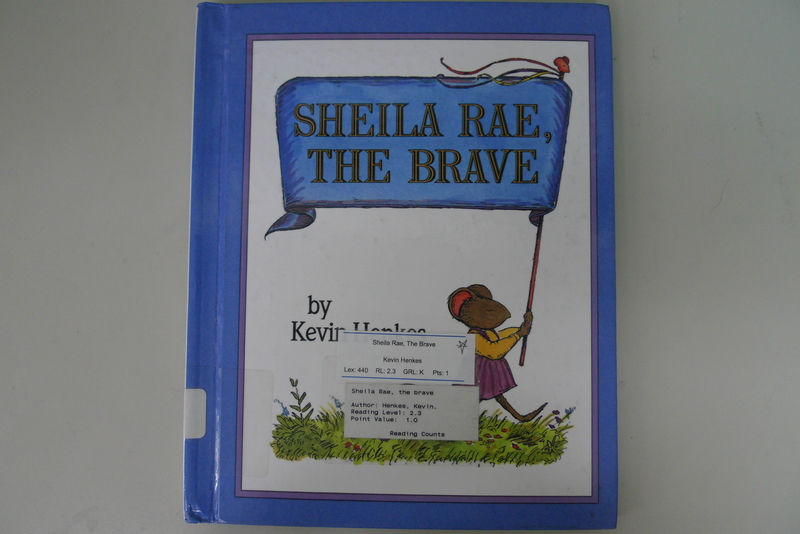 I read the Kevin Henkes story, Sheila, The Brave. 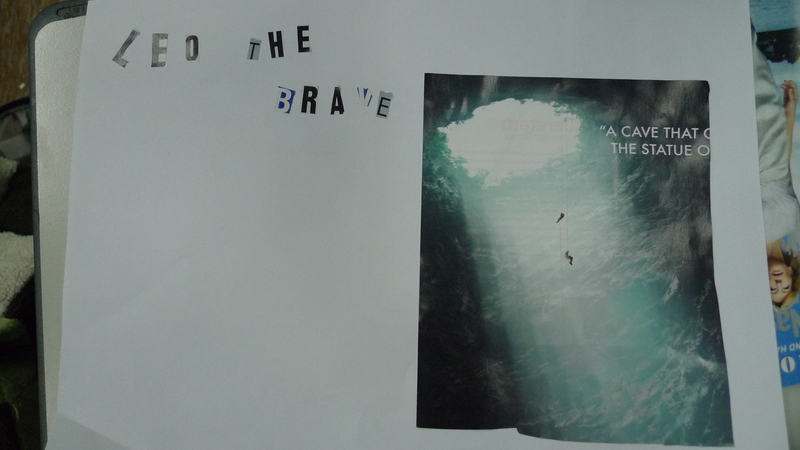 After reading the book, I asked students how Sheila was brave in the story. 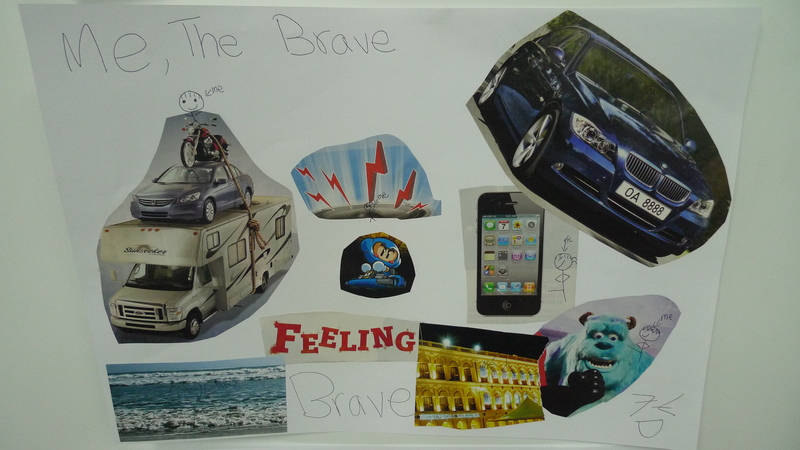 Then, on chart paper, we wrote down what it means to be brave. 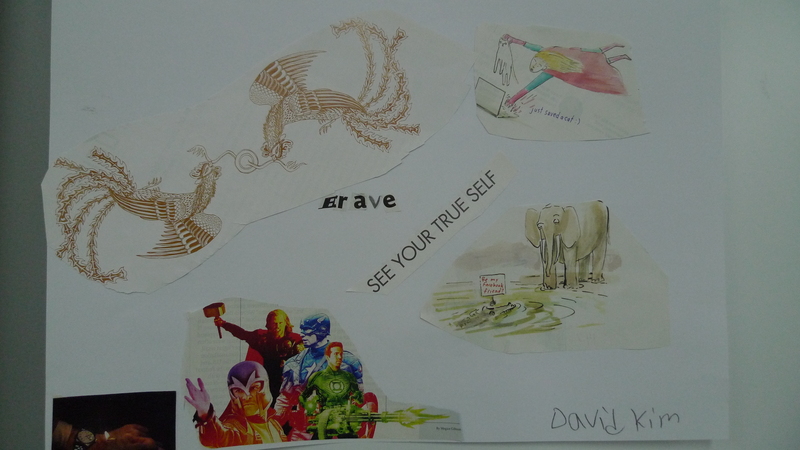 I explained that we would be making a collage about how we are brave or want to be brave. 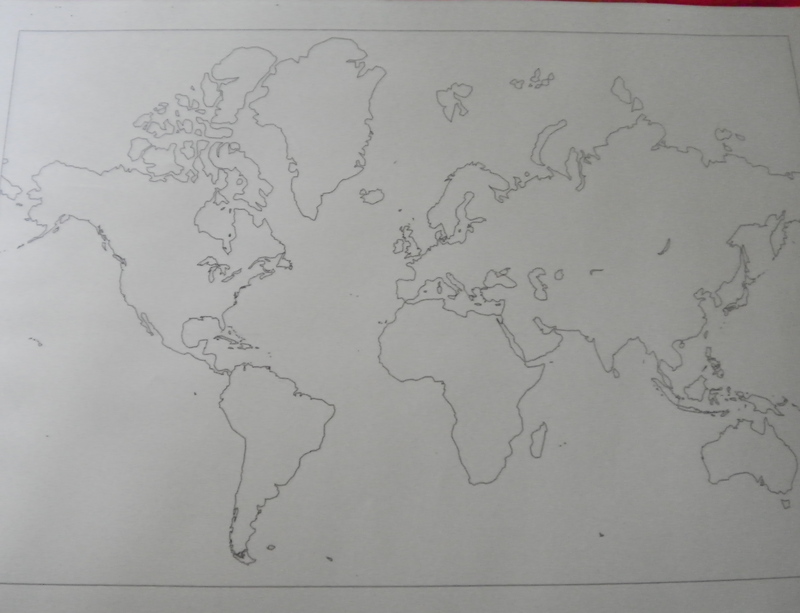 I did this activity with 3rd to 5th grade students. 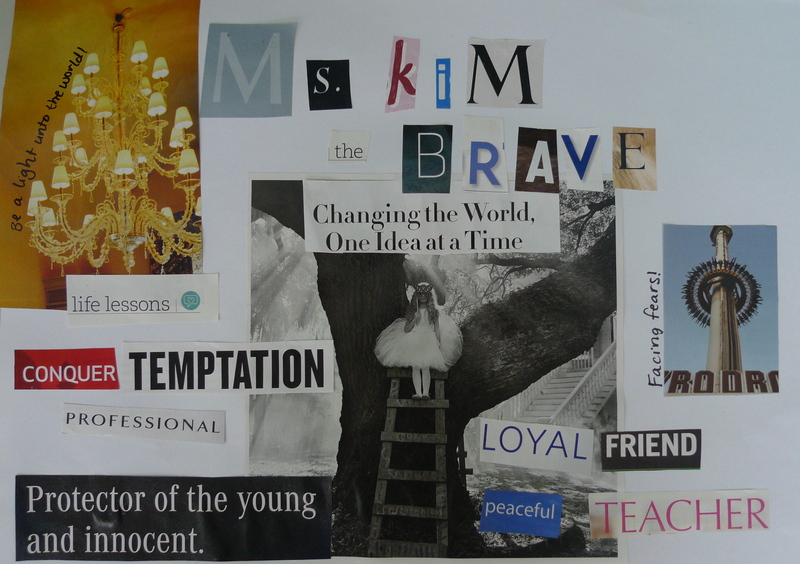 Here is my collage that I made to model to my students. I actually had a lot of fun doing it! 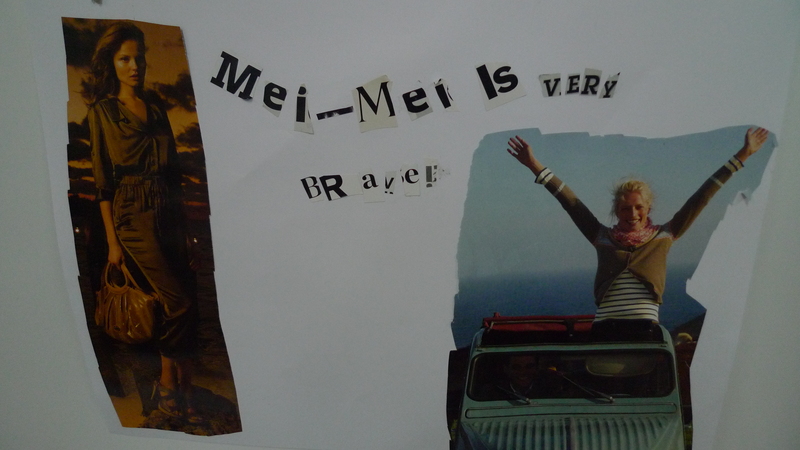 Then, the students were given white paper and old magazines to cut out photos and words from. I am always amazed by my students’ creativity!